"surfing light waves up in heaven"
SURFING FOR LIFE, a vibrant and award-winning one-hour documentary about inspiring well-spent lives, offers a totally fresh look at successful aging. 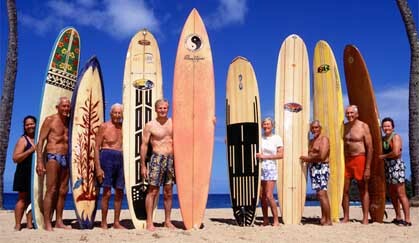 Narrated by Beau Bridges, it profiles ten legendary surfers who model healthy aging by staying active and engaged into their 7th, 8th and 9th decades. Through interviews, contemporary day-in-the-life footage, and a wealth of rare archival material, the film provides an eloquent and powerful antidote to the negative images of aging presented in America's youth-obsessed culture. It will be broadcast on public television stations throughout the country beginning April 14, 2001. The SURFING FOR LIFE web site was funded by Pacific Islanders in Communications, www.piccom.org. Web site advisors: Ben Finney, James Houston, Herb Kane. New York Times Magazine photo by Karen Kuehn/ Matrix. From left: Anona Napoleon, 59; John Kelly, 82; Woody Brown, 89; Fred Van Dyke, 71; Eve Fletcher, 74; Rabbit Kekai, 80; Peter Cole, 70; Shay Bintliff, 65. Listen to NPR's Weekend Edition interview with David Brown and Roy Earnest! 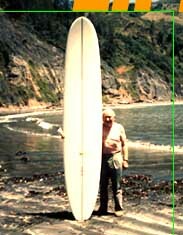 David L. Brown and three surfers from SFL were featured in a story on NPR's "Only a Game" on Saturday, April 14, 2001. SFL was the subject of a story on World News Tonight with Peter Jennings on July 13, 2000. SFL was also profiled in Modern Maturity (April/ May, 2001), Parade Magazine (April 8, 2001), Health Magazine (April, 2001), The New York Times Magazine (April 15, 2001), and Outside, Islands, Culture, Men's Fitness, Prevention and Swimmer magazines. David Brown appeared on the Jenny Jones Show, January 24th, 2001. In honor of an outdoor SFL screening in Haleiwa, the Mayor of Honolulu, Jeremy Harris, proclaimed June 30, 2002 "Surfing for Life Day" throughout Oahu, Hawai'i. The Haleiwa Beach Park audience of 20,000 may be the largest ever to attend a documentary or surf film.